The biggest hurdle with artificial intelligence is building a repository of answers for the AI to draw from. 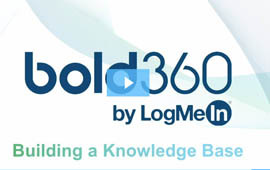 But with Bold360, building that knowledge base is faster and easier than ever. Existing FAQs can easily be imported, and our clean and simple interface makes it easy for any business user to create new articles from scratch. With Bold360, building your knowledge base is quick and painless, so AI can start helping right away.